« Three years ago in Lawrence, Kan. I really love black-and-white film. I’ve said it before: Black-and-white film just lends this beautiful quality to any modern situation. It’s almost something of a throwback effect. 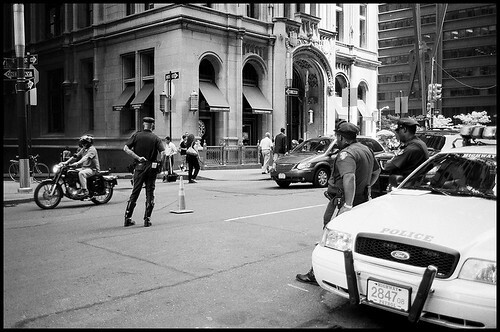 The motorcycle and NYPD car in the above photo give away the fact that the exposure was taken within the past few years, but the black-and-white impart almost a quality of romantic timelessness. It’s beautiful. 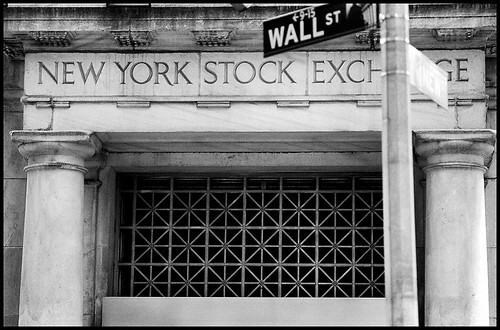 Jeff and I continued our walking tour of lower Manhattan by taking Broadway to Wall Street. Lower Manhattan is basically a series of canyon-like streets. I hope nobody has plants in their office windows — the buildings are so tall and close together that any window-side plants probably get no more than a few hours of even indirect sunlight. 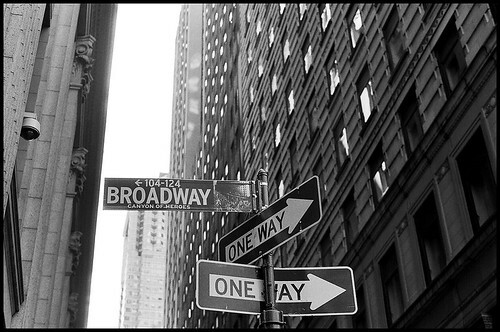 Not quite the Great White Way… at least, not this part of Broadway. After a quick stop at a Bank of America and a Borders bookstore on Broadway, we went down Wall Street. Be still my heart. 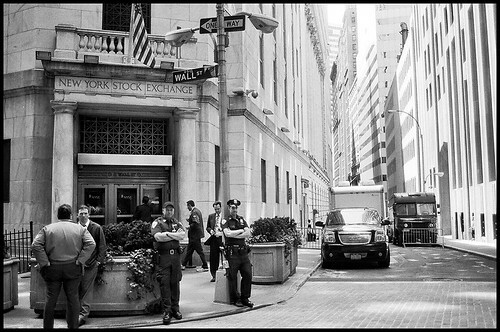 Cops buffing it up in front of the New York Stock Exchange building. In our foray down Wall Street — which lasted no more than three or four blocks — Jeff and I encountered the typical noonday mix of people. There were the cops strutting around with very visible firearms, the businessmen waiting at the best food vendors for their quick lunch run, the tourists milling about with maps and cameras slung over every part of their bodies. There was also Charles Pixley. 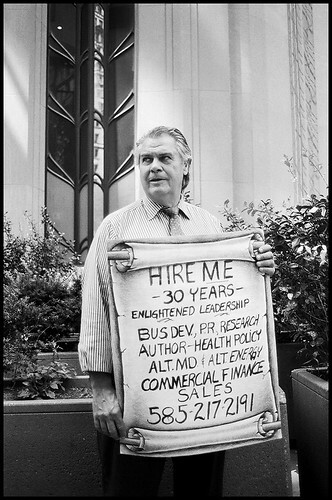 With his suit jacket resting on a potted plant nearby, Pixley was toting this very large sign when Jeff and I approached him, snapped a few photos and then chatted. Pixley said he lost his job earlier in 2009 and had experience in business, research and pharmaceuticals, and he engaged us in a 15-minute discussion about the current state of the financial markets. Turns out Pixley has since been hired. It also turns out Pixley was tried before the U.S. Supreme Court and convicted for “conspiring to defraud the Food and Drug Administration (FDA) by impeding an investigation, and 18 misdemeanor counts of introducing the Canadian health product 714X, developed by Canadian inventor Gaston Naessens, into interstate commerce” in 1996. Pixley was released in 1998, according to an archived e-mail cited on his LinkedIn profile. I can’t confirm what he was up to between then and when Jeff and I — and, I’m sure, many others — took his photo this summer. But, according to a news report (whose author misspelled “tenacity”), Pixley was gainfully employed in November. I can only hope that I won’t have to borrow a leaf from his book and hold my resume and phone number on the street after I graduate. on February 10, 2010 at 6:49 pm | Reply j.
hm.. seems like an interesting dude. i’m totally on board with that conspiring against the FDA thing, especially if it’s to do with naessens!! !